Enjoy eight days in the land of fire and ice with more comfort, luxury and surrounded by stunning nature and sights. This luxury getaway will sweep you off your feet from stunning glaciers to geothermal bathing, dancing lights. You will get around in your own private luxury vehicle on-road and go up on the amazing glaciers in Iceland, showcasing you the best of Iceland in the winter and making unforgettable memories that will last forever. 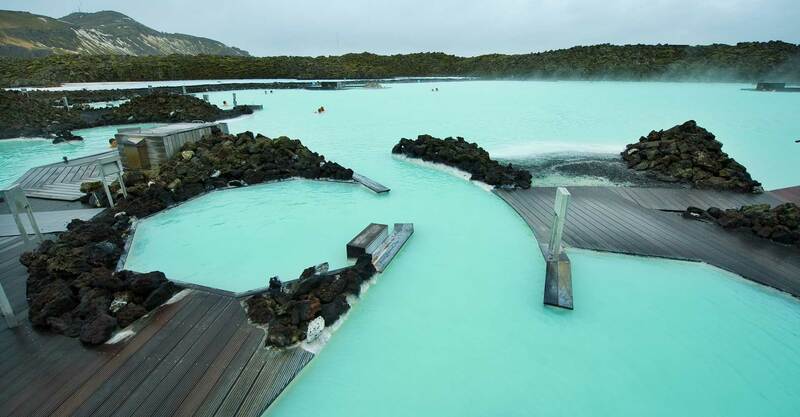 Everyone that have heard about Iceland know the Blue lagoon! 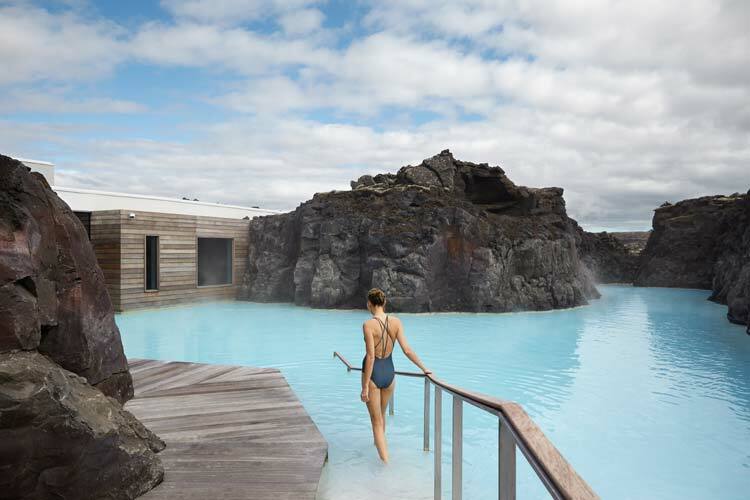 But not everyone know about the new Retreat spa that just opened in 2018, it’s a part of the Luxurious and first five start hotel in Iceland Retreat hotel that was built into the lava landscape. If you are planning to go to the blue lagoon but you’re not a person that likes to be in big crowds then this is the way to go! This is more private, with your own locker room and more luxury experience with options of in-water treatments. The Retreat Spa only allows limited number of people in at each time in order for the experience to stay unique and relaxing for everyone visiting this wonder of the world. There is a restaurant in the Spa if you want to have a light meal and you can stay up to four hours in the Spa. 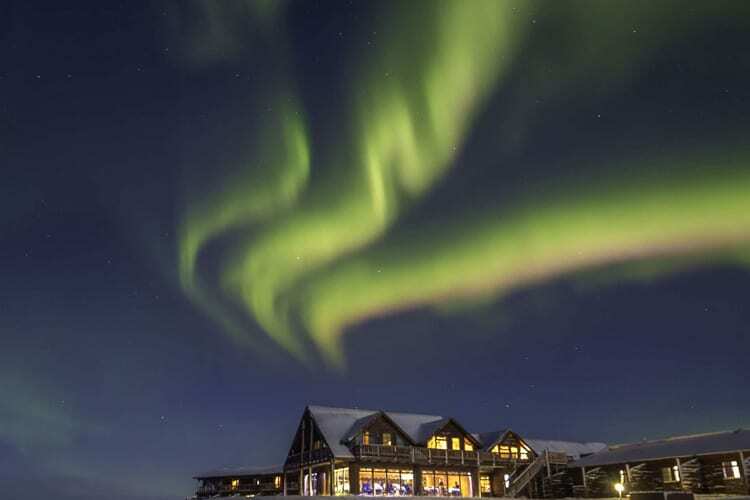 Hotel Rangá is the only four star resort in South Iceland offering 51 luxurious and cozy rooms in various price ranges, including the renowned continental suites, decorated and themed after the continents and a master royal suite. All rooms include a television, free WIFI internet, telephone, bathroom amenities, hairdryer, bathrobe(s), slipper(s), coffee and tea maker, minibar, 24 hour room service, laundry service and wake up service. The restaurant at Hotel Rangá is an acclaimed gourmet restaurant, overlooking one of Iceland’s finest salmon rivers, East-Rangá River and with a menu inspired by modern Nordic cuisine. On a clear winter night Hotel Rangá offers stargazing, The Hotel Rangá observatory has a roll-off roof that is by far the most advanced in Iceland. Needless to say, no other hotel in Iceland has anything like this to offer. Here you can star gaze into the black, clear sky and share an intimate evening with the universe and even share a romantic night with your spouse. The hotel observatory is located about 150 meters from the main building. It houses two high quality astronomical telescopes: A 14 inch Celestron Edge HD Schmidt-Cassegrain reflector and a TEC 160ED APO refractor on a Astrophysics 900 mount. Both telescopes are computerised and on a permanent pier — perfect for astrophotography. When you arrive in Iceland at Keflavik Airport, your private driver will greet you at the arrival hall and take you to your hotel in Reykjavik, where you will have the chance to rest before the evening. *We will keep the Northern Lights tour open during your stay and go out on the best night, that has the best chances of clear skies and activity. 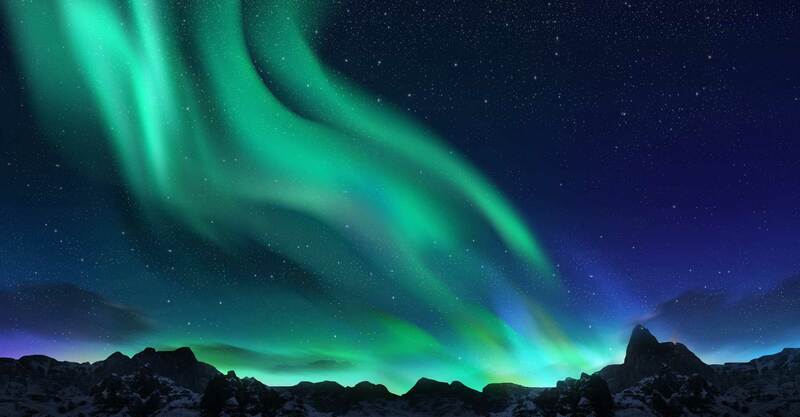 We leave the Northern Lights tour unpaid until we can confirm that we will operating the tour for that night. You will get an update from us every day during your stay, if we will be operating the tour that night or not. If we are operating the tour you will get the chance to go at extra cost that needs to be paid before the tour. We will be sending you an email before 5:00 PM every day, incase you can go on the tour we will be sending you a payment link to confirm your booking and the tour usually departs at 09:00 PM. Please note that we don’t offer a free retry an that The Northern Lights are a natural phenomenon and sights can never be guaranteed, but our guides have a lot of experience and will try their best to spot the Northern Lights and go to the right location for that night. When you land in Reykjavik you will be taken to your hotel in Reykjavik which has a Spa where you can relax and get ready for a fine dinner at one of Iceland’s most popular restaurants and enjoying your night. On this day you will be taken to the Golden Circle, which is one of Iceland’s most popular tours. 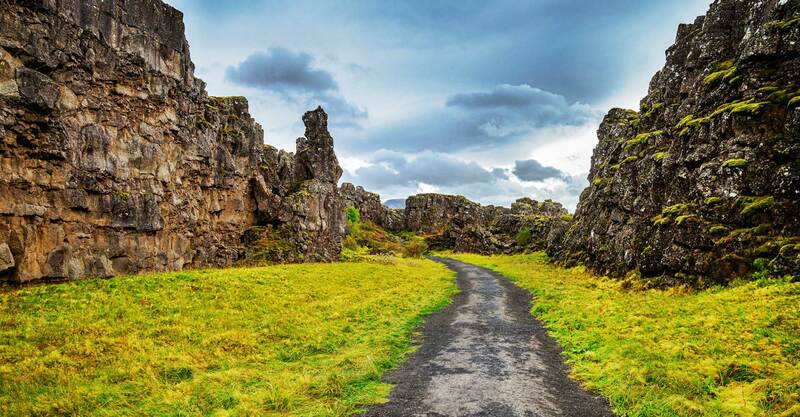 This tour will take you to the Þingvellir National Park, where you can learn about the world’s first parliament. You will then see Iceland’s most beautiful waterfall Gullfoss( Golden Falls), followed by the Geysir geothermal field. On this day you will get right into the action and head straight for the beautiful Icelandic south shore. 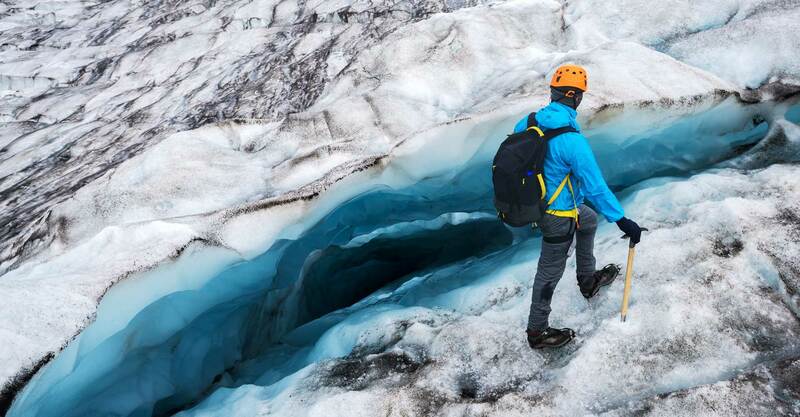 A guide will take you on the ice for a hiking tour on Sólheimajökull glacier. 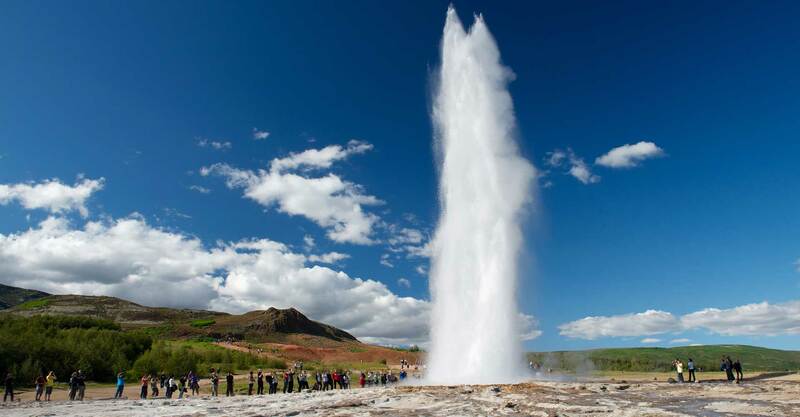 You will be taken to see both the Seljalandsfoss waterfall and Skógafoss waterfall, as well as Reynisdrangar Cliffs. After all this our guide will take you to your hotel for the night. You will start the day by stopping at the Lava Center at Hella before visiting a local farm to get familiar with the Icelandic farm life and enjoy a cup of coffee and Icelandic Pancakes and afterwards top the day by going snowmobiling up on Eyjafjallajökull the infamous glacier that erupted in 2010. At the Lava center you will visit the exhibition halls and use the interactive displays to discover the colossal and complex natural forces that shape the Earth and began to create Iceland tens of millions of years ago. In the morning start heading to the amazing Reykjanes Peninsula. Take a look at Gunnuhver hot spring, Reykjanesviti and the bridge between two continents. 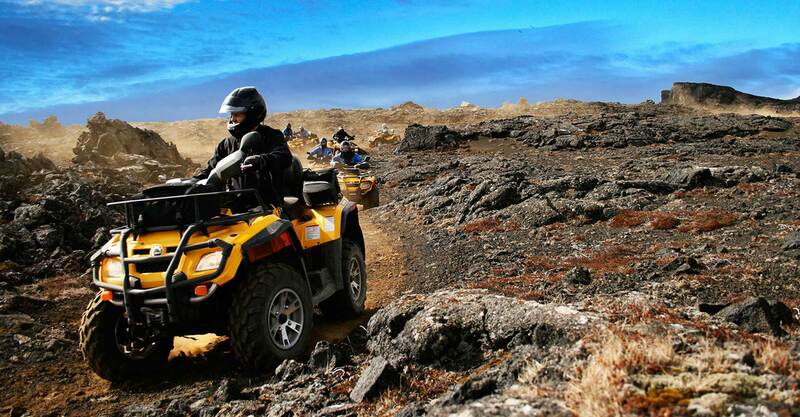 Afterwards you will head to Grindavík for a 1 hour atv tour through the lava fields of Reykjanes. After all this head to the Blue Lagoon for a fine lunch at LAVA restaurant before soaking in geothermal waters and one of the wonders of the world. There you will have access to the new Retreat Spa, relax and float in the soothing warm geothermal waters. After enjoying everything that the Blue Lagoon has to offer your private driver will take to your hotel in Reykjavik for the night. Spend the whole day relaxing and discovering Reykjavik. Your hotel is located downtown near all the main shops and attractions. Therefore, it is very easy to wander around and explore at your own pace. 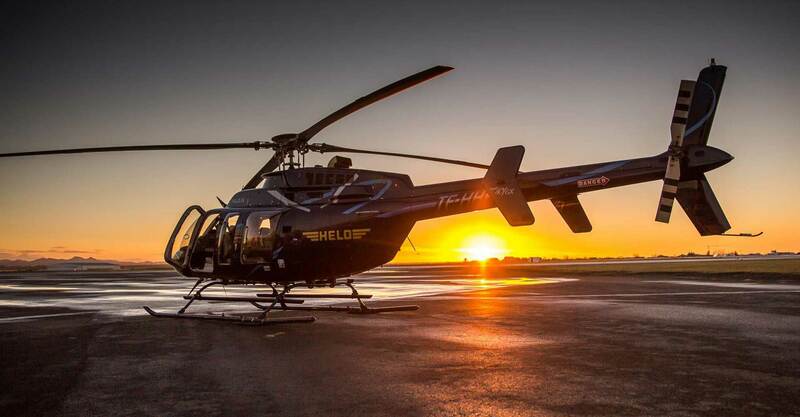 On the last day you will be picked up by a private chauffeur and driven to the airport in time for your flight. *You have to be at Keflavik airport 2 hours before departure. Over the 2018-2019 holiday break I decided to take my three late teen and early 20’s sons to Iceland. I am very lucky to have identified Deluxe Iceland run by Sigurður Magnússon as my tour organizer. Sig was extremely helpful in putting together a trip tailored to my requests. 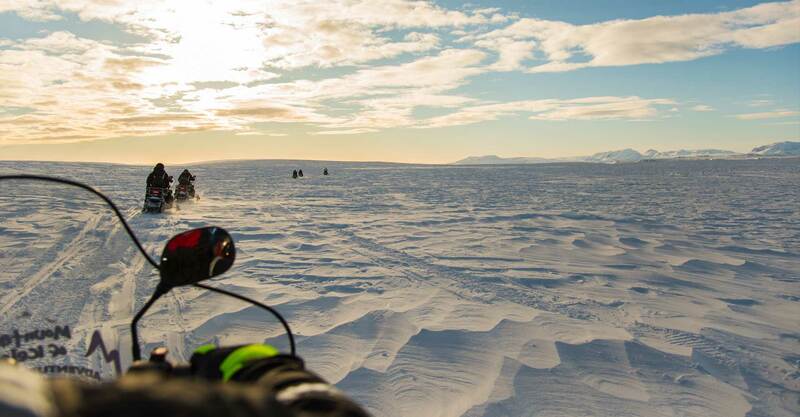 In our case, we were looking for adventure and high energy and with Sig’s help we were able to pack in snow mobiling, dune buggying and ATVing— all while taking in the stunning features of Iceland’s landscape. Sig recommended excellent hotels and the drivers that met with us every day were extremely nice and knowledgeable. Sig was patient as well, as I had to change my dates a couple of times in the planning process. All in all- a 10 plus!! Working with Sig, the company owner, over email, this trip came together very easily. I had certain things that I wanted to see and Sig filled in the rest. We went directly from the airport to the Blue Lagoon, and had a first class spa experience there that I didn’t even know was available (Thanks, Sig!). We stayed at Hotel Ranga for 3 nights, a great base for our day trips. Great place, delicious food. We had a super Jeep experience into the wilderness with Lulle, who entertained us all day with great Icelandic stories. Andri took us out for Northern Lights hunting. All of the guides were great! Knowledgeable, fun to talk to, always on time and eager to please. I can’t say enough about how great this tour company is. I wanted to visit the Saga Centre (museum) which is closed in the winter, and Sig got them to open just for me. Sig chose Hotel Borg for our last 2 nights in Reykjavik, a wonderful hotel in a great location. Couldn’t be happier. My husband, twin 15 yo teens and I traveled to Iceland in March for one week and had a truly amazing experience! From beginning planning stages to the very end we were treated with customized and highly personalized care. All activities were hand crafted for our level of ability and interest for adventure. Our accommodations were first class and met all expectations. The restaurants, food, and service along the way was top notch. Sig, the owner and our guide Andri were the epitome of professionals. They were extememly knowledgeable and eager to share about their country. They were friendly and affable. They went above and beyond in every way. We have travelled the world with many high end groups and this is an outstanding outfit. I highly recommend them without hesitation. In fact we will definitely return and use them again in the future. We look forward to seeing Iceland in all its glory in the summer months. Kudos Deluxe Iceland! !